Let’s think about some of the procurement options available to Washington. A recent International Security article by Stephen Biddle and Ivan Oelrich (summarized here, here, and here) foresees an East Asian military landscape in which states use land-based cruise, ballistic, and surface-to-air missiles to develop anti-access/area denial bubbles. Skeptical of the prospects for breaking such a system, Biddle and Oelrich predict a future in which the military balance decidedly favors the defense. As the Biddle and Oelrich article suggests, the United States is developing a broad array of weapons to contest China’s system of anti-access systems. These include long-range sensor and strike drones, advanced satellites, long-range strike vehicles, hyper-sonic weapons, submarine launched cruise missiles, and stealth aircraft such as the F-35 Joint Strike Fighter and the B-21 Long Range Strike Bomber. 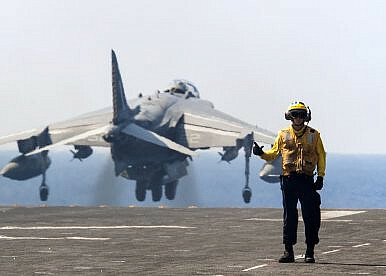 Along with a series of bureaucratic reforms, training projects, and communications enhancements, these procurement priorities constitute what was until recently known as “AirSea Battle.” This system of systems offers a toolkit for penetrating the system of anti-access systems that China (and to a lesser extent Russia and Iran) have developed. Fortunately for the United States, the former is considerably more flexible than the latter. But what if the United States accepted Biddle and Oelrich’s basic verdict, agreeing that penetration and destruction of an A2/AD system would quickly become cost-prohibitive? To phrase somewhat differently; if the United States decides against a military procurement strategy focused on ASB-style penetration of a system of A2/AD systems, what would it buy instead? On the one hand, the U.S. would gear procurement and innovation around the kinds of weapons that U.S. competitors (China and Russia, predominantly) already do well. This includes surface-to-air missile systems, land and sea-based cruise missiles, and potentially even tactical ballistic missiles, which the United States has never operationally deployed. The U.S. would also continue to work on the eyes and ears of the reconnaissance-strike complex, including satellites, spy aircraft, and a wide variety of air and sea-based drones. Similarly, the U.S. would continue to develop its communications and electronic warfare capabilities, the latter ensuring that U.S. forces can keep in touch with each other, and the former helping to prevent enemy forces from getting a clear sense of the battlespace. The United States would also need to carefully navigate the current legal restrictions on the development and export of missile technology, either of the cruise or ballistic variety. Whether this would mean wholesale revision of those treaties (which the United States has worked very hard to develop and preserve) or simply circumvention (finding ways to transfer key technologies that don’t upset the treaties) would obviously depend on context. What does this leave out? Mostly, the kinds of high-end, expeditionary capabilities that the U.S. Air Force and U.S. Navy have concentrated their attention on. Stealth fighters, manned stealth bombers, and advanced means of delivering troops to shore under fire would all suffer if the United States chose to de-emphasize efforts to penetrate and defeat A2/AD networks. Aircraft carriers would take on a different role than predicted, acting as mobile backstops and focal points for land-based A2/AD systems, rather than as penetrators. Legacy aircraft and missiles, as well as moderately priced new systems, would serve the traditional role of supporting expeditionary forces in permissive air and sea spaces. In sum, a lot would change, and a lot wouldn’t. Lots of weapons are flexible enough to support A2/AD, while also supporting efforts to defeat A2/AD. Over time, however, U.S. decision makers should strive to bring together strategic aspirations with a thorough understanding of the technological landscape, and adjust procurement policies accordingly. Are the United States and China Condemned to a Military Stalemate?For the First Time Since the B-17, America Might Have a Bomber Designed for AsiaIs Air-Sea Battle Irrelevant?AirSea Battle, A2/AD and the Offense-Defense BalanceAmerica’s AirSea Battle vs. China’s A2/AD: Who Wins?